What's better than messy play? Well, everyone apart from Georgie. He's still a bit young for papier mache I think. He'd only eat the glue and paper, so we waited until he was having his afternoon nap, and then me, the Hubby, Big Lad and Blondie got good and messy together! If you missed why we're doing this, then have a look at this post. 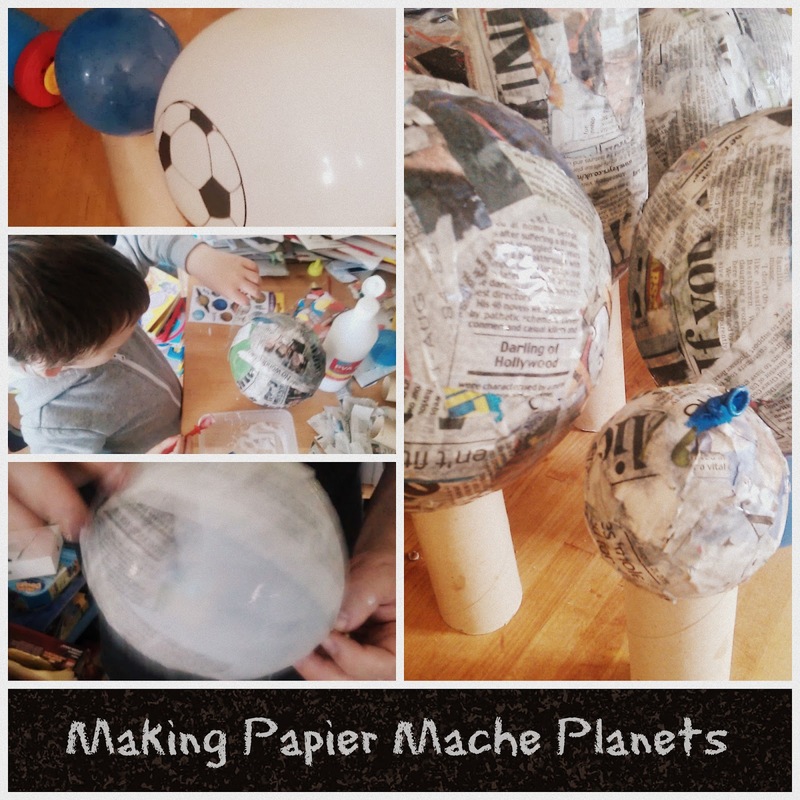 Jack's assignment for one planet has grown to a planet and a moon, so naturally Tom wants the same. And then me and hubby went "I love papier mache...." so we've made a planet each too. And a rocket. I think his teachers are going to know we've had a helping hand in this....... But anyway, at least they'll know he has parents who take an active interest in his school work (and hopefully don't TAKE OVER his home work, really need to watch ourselves for that). He's only taking his own in to class. This weekend we just covered the balloons in paper. We're going to paint them next weekend. They take a good long while to dry after all, and Jack is only 5, he gets bored quickly so doing this in stages over the half term works really well! Jack has a standard balloon for his planet, a water bomb for his moon, and a long balloon for his rocket - which he wants to paint up like "Neil Armstrong Rocket!" so I'm going to find him pictures of Apollo 11 to work from. Jack has also been talking to his Nana about the moon landing because she watched it on TV when it happened. He's struggling to remember everything she said, but luckily she told me too. So through the week we're going to be writing it down in his little scrap book.